Interactive Game by Radica Games. 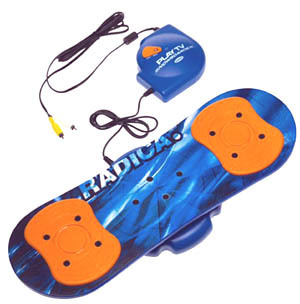 Go in search for big air with Radica's Play TV Snowboard. Just connect the game to your TV or VCR. Get on your snowboard and start shreddin' the course. As you maneuver the snowboard, see the corresponding actions in full color and stereo sound on you TV screen. Choose from 4 exciting games. Free Ride/Trick Run, Timed Slalom Competition, Half-Pipe Trick Competition and Big-Air Competition. Compete for time and style points. If you want to win, avoid the obstacles and collect special power balls to increase your speed. In a very short period of time snowboarding has become as popular as skiing among winter sports enthusiasts. But while it can be a heck of a lot of fun, it's not exactly forgiving to novices. Fortunately, this living room version affords all the pleasure of boarding without any of the bruises or broken bones. The plastic board, which can hold up to 180 pounds, hooks up quite easily to any common TV. Once on board, riders can select one of four modes: half-pipe, slalom, big air, or freestyle. All selections are made using the board itself, and we found the interface to be a bit cumbersome at first. But once we got the hang of it, we were boarding our way down countless ski slopes and having a great time. While the graphics are not up to the quality of an Xbox game, playing a game while riding on an actual board is a hoot.